Go to the light curve generator of the AAVSO, enter "eps aur" as the object, 60 or 80 days as the interval and select only "V" magnitudes: out comes a light curve that monotonously falls from a level 3.0 mag. to 3.25 mag. right now over approximately the past month (using "visual" instead leaves a much noisier picture). Thus the long-awaited eclipse of mystery star Epsilon Aurigae has clearly begun, the first in 27 years - and this time the interest is higher than ever, esp. with the (much promoted) Citizen Sky campaign under way. Here the lightcurve is discussed in detail (earlier, still earlier, even earlier); using the last eclipse of the weird long-period system as a template, the brightness should drop to 3.8 mag. over the next two to three months and then hover there throughout 2010. • Meanwhile an outburst of Z And has been reported. In other news there were two sunspot groups on the disk simultaneously, something not seen in a long time! A close-up of one of the groups on Sep. 26 (when also a big prominence was seen) and reports from Sep. 23 (more), Sep. 22 and Sep. 21. • Sun-related also a comparision of H-alpha telescopes (but is it fair?) and new insights about the solar cycle and a current surge of cosmic rays due to the low activity level (more, more and more). • In the comet world we have the first discovery by the La Sagra Sky Survey, comet 217P over M 42 (also an AAPOD) and one day later, Garradd with a long tail (by F. Kugel), the case of Pigott-LINEAR-Kowalski and Christensen. • Big bolides have been reported e.g. 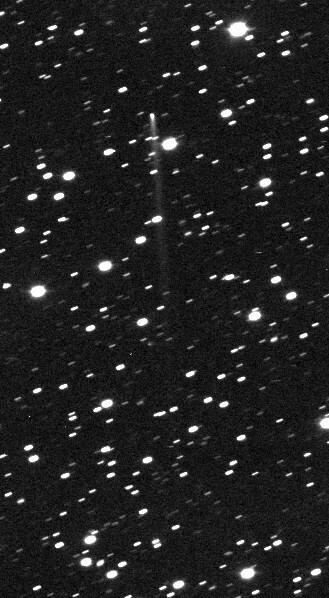 from Argentina, Canada and Namibia, numerous new weak meteor showers have been recognized; we have a new PHA - and the discoverer of 2008 TC3 has now a piece of "his" asteroid after it turned into a meteorite shower over Sudan! There will be a conference on the subject right there, in December - including further meteorite searching! • Here is a long report about a possible detection of Io's atmosphere by an amateur during a mutual event; also "normal" event reports of Sep. 26 (also as a dramatic video!) and Sep. 9. Plus fine Jupiter images from September and also July - the latter taken at Pic du Midi with 1 meter. • There's now another Galaxy Zoom concentrating on the center region (also reported here) - plus a direct comparision of the two full-sky mosaics discussed 2 weeks ago: Mellinger's has higher resolution becuase Brunier's is actually oversampled. (There's also a another mosaic of only the Lagoon Nebula.) • A short-lived rocket experiment created a glowing cloud in the U.S. sky, causing some news coverage (see also here, here and here). • Also a remarkable amateur picture of the HTV (see also here and here) - and amateur satellite watchers found out what a secret satellite is probably good for. • Sky highlights in October 2009 mostly deal with constellations of the planets. Oct. 8 morning: Mercury just 0.3° SW of Saturn (which just emerges from the Sun's glare); Mercury 5 times brighter. Meteor-wise it'll be mainly the Orionids that should cause interest - and around their Oct.21 peak the Moon is practically gone. • Finally a report from the HHT, a star party in Eastern Germany (another, another and another report); also a note on a starparty on Palomar Mtn. - and the 1st issue of Practical Astronomy is out. Who's got the best mega-mosaic of the whole sky in visible light? What an amazing coincidence: Practically simultaneously two color mosaics of the whole sky with more than half a billion pixels each have been published, one by a physicist, the other by a science writer, but both did their work as tireless amateur astronomers over many months. One is by Axel Mellinger who also describes his work in a scientific paper: Great care was taken to achieve photometric calibration and foreground subtraction. This amazing achievement went unnoticed in an ESO Press Release a few weeks later presenting another mosaic by Serge Brunier which has even more pixels but less photometric precision it would seem (the images were taken with a DSLR cameras and stitched with commercial software). Still ESO is incorporating the latter mosaic into its "Giga-Galaxy Zoom" project - let's see which mosaic will become the new gold standard (as Mellinger's original mosaic made from chemical pictures in 2000 might be called). In other news we have a rare outburst of the suspected UGWZ star VX For (a sensation for some), the 125th supernova discovery by an individual amateur, the Catalina Real-Time Transient Survey (where everyone can help) and the Hyper-Velocity Stars Project utilizing the SDSS Galaxy-Zoo-style. • From the 22 July Total Solar Eclipse we have a hi-res corona composite and a 3rd contact by Druckmüller & al., the official word and a 21-min. video about the Indian commercial eclipse flight, pictures and a slide show from Wuhan, a report from Hangzhou, a narrated slide-show from Wuzhen (featuring yours truly; incl. Wuhan) and a report from Shanghai. There are also a very detailled report on the 1 Aug. 2008 TSE, a speculative "eclipsology" blog - and, vastly more on the fringe, the TSE/UFO madness of 2009 ... • Talking about the Sun, there are speculations about its fading B field (summarized here and discussed here) and facts about the - minuscule - climate impact of solar events. And it was 150 years ago that the most powerful flare ever struck. Sep. 16: Uranus in Opposition at 5.7 mag. (try it with the naked eye). Sep. 17: Saturn in Conjunction with the Sun, spoiling attempts to follow the ring plane crossing events from Earth. Sep. 29: The Moon visits Jupiter, still a great sight (and the main target of the Galilean Nights a month later). While the planet Mercury is in conjunction with the Sun this month, it can still be "observed" very well near the end of it, by the way: MESSENGER will perform its 3rd close fly-by on Sep. 29 (about when a morning apparition begins) for a final gravity assist that will enable it to enter orbit about Mercury in 2011. With more than 90 percent of the planet’s surface imaged during the previous two fly-bys, the team will turn its instruments on specific features and uncover more information about the planet closest to the Sun.